(CNN) -- At least 15 people were killed and 45 others wounded in a bombing and gunfire near Iraq's central bank in the capital on Sunday, according to the Interior Ministry. After the initial blast, clashes broke out between security forces and armed men trying to rob the bank, the official said. There were conflicting reports about what the blast was, which hit at around 3 p.m. (8 a.m. ET). One Interior Ministry official said at least three roadside bombs exploded outside the bank, while another official said it was a suicide bomber. The spokesman for the Baghdad military command, Maj. Gen. Qassi, al-Moussawi, told state television that it was one roadside bomb. The casualties figures offered by the Interior Ministry only include civilians and security forces. 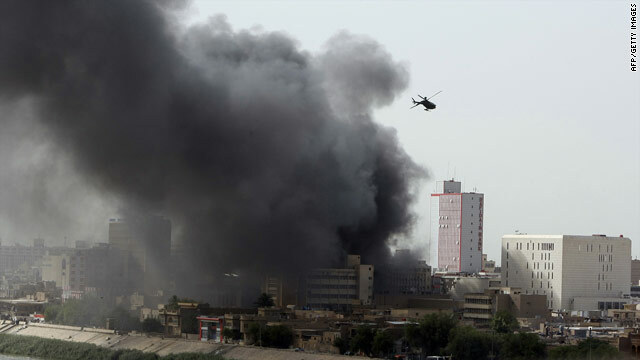 The power generator for the bank caught fire and the burning fuel caused a large black plume of smoke seen over the capital, the first Interior Ministry official said.The bank is located in central Baghdad's Rasheed street. The bombing comes amid political uncertainty, a day before Iraq's parliament is set to convene for it's first session three months after national elections.